Janna hails from Pictou, Nova Scotia, Canada and currently lives in Kingston, Ontario where she is in school for Child and Youth Counseling – training that she plans on using to work with at-risk youth. In the past eight years, Janna has only missed one summer at Camp Echo Lake while working as a child behavior therapist for autistic children. She is very excited to be returning for her 7th summer at Echo Lake. As the Main Village Program Coordinator, Janna works closely with Kelly Godzac, Becca Zukowsky and the rest of the program staff to plan evening programs and special days/events. In addition to her programming duties, Janna handles elective signups and staff assignment, and also acts as the liaison between the group leaders and Glenn Begly to coordinate inter-camp games. Her job keeps her very busy, but if anyone has the energy to handle it, Janna does! 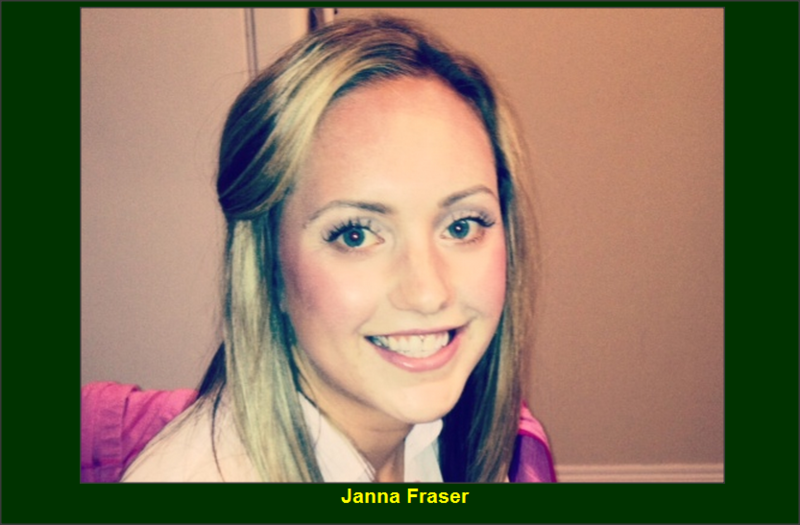 Janna loves working with kids and everything about the outdoors. She knows what it takes to set goals and stay focused on achieving them, as evidenced by her running of a full marathon, and her plan to work at Echo Lake when she turned 18 (she was 12 when she set the goal with her best friend). This will be my 7th summer at Camp Echo Lake. My best friend’s cousin worked at camp for nine summers and he told us about it when we were 12-years old. As soon as my best friend and I learned about the camp, we set a goal to work there together when we turned 18 – and we did! My family went to a 10-day family camp every summer, and I also went to a week-long summer camp each year on my own. Echo Lake is special to campers and staff because of the friendships that develop there. It is an environment like no other that I’ve ever experienced. The numerous special bonds that are made at camp continue on for many years to come. The memories made and the moments shared together are truly priceless. I’ve only missed one summer since I started working here, and even then, I came back to visit for a week to be a part of the magic. I’m currently at school doing a Child and Youth counseling program in Ontario. My hobbies are running, traveling, swimming, reading, cooking, hiking, and anything outdoors! One of my most interesting travel stories relates to the time that I spent in Central America, a place that has always intrigued me. As an undergrad, I wanted to do some volunteer work, so I targeted Central America and ended up living in Honduras for eight months. Going from camp to Honduras and back to camp was a whirlwind experience of total diversity. My favorite Echo Lake activities are swimming in the lake, campfires, Trek activities and trips, boating, land sports and archery. As a former lifeguard at the camp, I have always had a great affinity for the lake, but the thing that I love most about free swim is that I get to be around a bunch of different kids at the same time. One of the changes that I’m excited about for this coming summer is that all of the kids will have free swim for their final period (half in the lake, half in the pool). By the end of the day, kids are already tired from such a full day of activities that they just wanted to relax a bit before dinner and evening activities. Last summer, I was able to run the whole Main Camp Apache Relay. It was amazing to see all of the campers work towards a common goal while showing incredible spirit and support for each other. Las year’s Apache Relay was particularly exciting because only one minute separated the two teams at the end. Another very fond memory for me was going on the FINOE trip a few summers ago. I was able to go fishing, camping and canoeing with a few of the Lower Inter Girls and it was an incredible experience. It was the first one that I had been on, and I really enjoyed spending quality time with the girls. It was actually my day off, but they needed someone to serve in a counselor role, and since I love the outdoors, I gladly gave up my day off to go on the trip. As program coordinator, I don’t get much time to spend with the campers directly, so I really cherished this experience. What could be better than a day of bonding outdoors in such a beautiful place?